The Belovezha Accords (Russian: Беловежские соглашения, Belarusian: Белавежскае пагадненне, Ukrainian: Біловезькі угоди) are the agreement that declared the Union of Soviet Socialist Republics as effectively ceasing to exist and established the Commonwealth of Independent States (CIS) in its place as a successor entity. It was signed at the state dacha near Viskuli in Belovezhskaya Pushcha on December 8, 1991, by the leaders of three of the four republics-signatories of the Treaty on the Creation of the USSR – Russian President Boris Yeltsin and First Deputy Prime Minister of RSFSR/Russian Federation Gennady Burbulis, Ukrainian President Leonid Kravchuk and Prime Minister of Ukraine Vitold Fokin, Belarusian Parliament Chairman Stanislav Shushkevich and Prime Minister of Belarus Vyacheslav Kebich. The original accord could not be found as of 2013 (see below). The name is variously translated as Belavezh Accords, Belovezh Accords, Belavezha Accords, Belavezha Agreement, Belovezhskaya Accord, Belaya Vezha Accord, etc. While doubts remained over the authority of the leaders of three of the 12 remaining republics (the three Baltic republics had seceded in August) to dissolve the Union, according to Article 72 of the 1977 Soviet Constitution, Soviet republics had the right to secede freely from the Union. On December 12, 1991 the Supreme Soviet of the Russian SFSR ratified the accords on behalf of Russia and at the same time denounced the 1922 Treaty on the Creation of the Soviet Union. While this is sometimes noted as the moment that the largest republic in the Soviet Union effectively seceded, this is not the case. Rather, the RSFSR appeared to take the line that it was not possible to secede from an entity that no longer existed. However, in the aftermath of the failed coup in August 1991, the Communist Party of the Soviet Union had been effectively dissolved and the republics were scrambling to pull free of Moscow. By the end of the summer of 1991, Soviet President Mikhail Gorbachev could no longer influence events outside of the Kremlin. He was being challenged even there by Yeltsin, who by the end of the fall had taken over most of the Soviet government. The preamble of the document stated that "the USSR, as a subject of international law and a geopolitical reality, is ceasing its existence". It also invited other republics to join the three founding members. The fate of the multinational state cannot be determined by the will of the leaders of three republics. The question should be decided only by constitutional means with the participation of all sovereign states and taking into account the will of all their citizens. The statement that Unionwide legal norms would cease to be in effect is also illegal and dangerous; it can only worsen the chaos and anarchy in society. The hastiness with which the document appeared is also of serious concern. It was not discussed by the populations nor by the Supreme Soviets of the republics in whose name it was signed. Even worse, it appeared at the moment when the draft treaty for a Union of Sovereign States, drafted by the USSR State Council, was being discussed by the parliaments of the republics. There was some question as to whether the Belavezha Accords were enough in and of themselves to dissolve the Soviet Union, since they were signed by only three republics, albeit three of the five largest and most powerful republics. However, all doubts about whether the Soviet Union still existed were removed on December 21, 1991, when the representatives of 11 of the 12 remaining Soviet republics—all except Georgia—signed the Alma-Ata Protocol, which confirmed the extinction of the Soviet Union and restated the establishment of the CIS. Given that 11 of the republics now agreed that the Soviet Union no longer existed, the plurality of member-republics required for its continuance as a federal state was no longer in place. The summit of Alma-Ata also provisionally accepted Gorbachev's resignation as president of the Soviet Union and agreed on several other practical measures consequential to the extinction of the Union. Gorbachev stated that he would resign as soon as he knew the CIS was a reality. Three days later, in a secret meeting with Yeltsin, he accepted the fait accompli of the Soviet Union's dissolution. However, for four more days a rump Soviet federal government continued to exist, and Gorbachev continued to hold control over the Kremlin. This ended in the early hours of December 25, 1991, when Gorbachev resigned and turned control of the Kremlin and the remaining powers of his office over to the office of the president of Russia, Yeltsin. 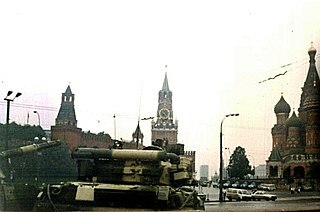 Gorbachev's televised resignation speech and the subsequent lowering of the flag of the Soviet Union and hoisting of the flag of Russia on the flagpole in front of the Kremlin was broadcast around the world. On this day, President of the United States George H. W. Bush, a former head of the CIA, gave a short speech on national TV in the United States to commemorate the ending of the Cold War and to recognize the independence of the former states of the Soviet Union. Also on December 25, 1991, the Russian SFSR, now no longer a sub-national entity of the Soviet Union but a sovereign nation in its own right, adopted a law renaming itself the "Russian Federation" or "Russia" (both being equally official). Gorbachev's speech and the lowering of the Soviet flag marked the end of the Soviet Union in the eyes of the world. However, the final legal step in the dissolution came a day later, when the Soviet of the Republics, the upper house of the Supreme Soviet of the USSR, recognized the collapse of the Union and voted both itself and the Union out of existence. The lower house, the Soviet of the Union, had not met since December 12 when Russia recalled its deputies from both chambers, leaving it without a quorum. The Summit of Alma-Ata also issued a statement on December 21, 1991 supporting Russia's claim to be recognized as the successor state of the Soviet Union for the purposes of membership of the United Nations. On December 25, 1991, Russian President Yeltsin informed UN Secretary-General Javier Pérez de Cuéllar that the Soviet Union had been dissolved and that Russia would, as its successor state, continue the Soviet Union's membership in the United Nations. The document confirmed the credentials of the representatives of the Soviet Union as representatives of Russia, and requested that the name "Soviet Union" be changed to "Russian Federation" in all records and entries. This was a move designed to allow Russia to retain the Soviet Union's permanent Security Council seat, which would not have been possible if the former republics were all reckoned as equal successors of the Soviet Union, or if the Soviet Union was regarded as having no successor state for the purpose of continuing the same UN membership (see Russia and the United Nations). The Secretary General circulated the request, and there being no objection from any Member State, the Russian Federation took the Soviet Union's UN seat. On January 31, 1992, Russian Federation President Yeltsin personally took part in a Security Council meeting as representative of Russia, the first Security Council meeting in which Russia occupied the permanent Security Council seat originally granted to the Soviet Union by the UN Charter. Stanislav Shushkevich, the former leader of Belarus was told by the country's foreign ministry that the original accords have gone missing as of February 7, 2013. He tried to obtain the original copy to assist in writing his memoirs. The Russian Federation has breached the Belavezha Accords in 2014 following the annexation of Crimea from Ukraine. Union Treaty of 1922, which was denounced by the Belavezha Accords. ^ Mikhail Sergeevich Gorbachev (2000). On my country and the world. Columbia University Press. ISBN 978-0-231-11514-8. ^ "Bush on the Commonwealth of Independent States". Encarta. Archived from the original on October 31, 2009. ^ "Document proclaiming death of Soviet Union missing". The Daily Telegraph. London. February 7, 2013. ^ "Belavezha Accords, signed by Russia, Ukraine, and Belarus, also violated by Russia". Wikimedia Commons has media related to Belavezha Accords. The Republics of the Union of Soviet Socialist Republics or Union Republics were the ethnically based proto-states of the Soviet Union. For most of its history, the USSR was a highly centralized state; the decentralization reforms during the era of Perestroika ("Restructuring") and Glasnost ("Openness") conducted by Mikhail Gorbachev are cited as one of the factors which led to the dissolution of the USSR in 1991. The politics of Belarus takes place in a framework of a presidential republic with a bicameral parliament. The President of Belarus is the head of state. Executive power is exercised by the government, at its top sits a prime minister, appointed by the President. Legislative power is de jure vested in the bicameral parliament, the National Assembly, however the president may enact decrees that are executed the same way as laws, for undisputed time. Belarus's declaration of independence on 27 July 1990, did not stem from long-held political aspirations but from reactions to domestic and foreign events. Ukraine's declaration of independence, in particular, led the leaders of then Belarusian SSR to realize that the Soviet Union was on the brink of dissolving, which it did. Stanislav Stanislavovich Shushkevich is a Belarusian politician and scientist. From August 25, 1991 to January 26, 1994, he was the first head of state of independent Belarus after it seceded from the Soviet Union, serving as Chairman of the Supreme Soviet. He supported social democratic reforms and played a key role in the creation of the Commonwealth of Independent States. The 1991 Soviet coup d'état attempt, also known as the August Coup, was an attempt made by members of the government of the USSR to take control of the country from Soviet President and General Secretary Mikhail Gorbachev. The coup leaders were hard-line members of the Communist Party of the Soviet Union (CPSU) who were opposed to Gorbachev's reform program and the new union treaty that he had negotiated which decentralized much of the central government's power to the republics. They were opposed, mainly in Moscow, by a short but effective campaign of civil resistance led by Russian president Boris Yeltsin, who had been both an ally and critic of Gorbachev. Although the coup collapsed in only two days and Gorbachev returned to power, the event destabilized the USSR and is widely considered to have contributed to both the demise of the CPSU and the dissolution of the USSR. The Russian Federation succeeded the Soviet Union's seat, including its permanent membership on the Security Council in the United Nations after the dissolution of the Soviet Union in 1991. The succession was supported by the USSR's former members and was not objected to by the UN membership; Russia accounted for about half the Soviet Union's economy and most of its land mass; in addition, the history of the Soviet Union began in Russia. If there was to be a successor to the Soviet seat on the Security Council among the former Soviet republics, these factors made Russia seem like a logical choice. Nonetheless, due to the rather inflexible wording of the United Nations Charter and its lack of provision for succession, the succession's technical legality has been questioned by some international lawyers. The Union of Sovereign States was the proposed name of a reorganization of the Union of Soviet Socialist Republics into a new confederation. Proposed by the then President of the Soviet Union, Mikhail Gorbachev, the proposal was an attempt to avert an end to the Soviet Union. The proposal was never implemented in the wake of the August Coup in 1991 and the dissolution of the Soviet Union ultimately occurred on December 26th of that year. The overall proposal was resurrected as the Commonwealth of Independent States (CIS), although as a regional organization, not a confederation. A referendum on the Act of Declaration of Independence was held in Ukraine on 1 December 1991. An overwhelming majority of 92.3% of voters approved the declaration of independence made by the Verkhovna Rada on 24 August 1991. The Act of Declaration of Independence of Ukraine was adopted by the Ukrainian parliament on 24 August 1991. The Act established Ukraine as an independent state. The Constitution of the Soviet Union recognised the Presidium of the Supreme Soviet and the earlier Central Executive Committee (CEC) of the Congress of Soviets as the highest organs of state authority in the Union of Soviet Socialist Republics (USSR). Under the 1924, 1936 and 1977 Soviet Constitutions these bodies served as the collective head of state of the Soviet Union. The Chairman of these bodies personally performed the largely ceremonial functions assigned to a single head of state but held little real power. The Congress of People's Deputies of the Russian SFSR and since 1991 Congress of People's Deputies of the Russian Federation was the supreme government institution in the Russian SFSR and in the Russian Federation from 16 May 1990 to 21 September 1993. Elected on 4 March 1990 for a period of five years, it was dissolved by presidential decree during the Russian constitutional crisis of 1993 and ended de facto when the Russian White House was attacked on 4 October 1993. The Congress played an important role some of the most important events in the history of Russia during this period, such as the declaration of independence of Russia from the USSR, the rise of Boris Yeltsin, and economic reforms. The Alma-Ata Protocols are the founding declarations and principles of the Commonwealth of Independent States (CIS). The Russian Soviet Federative Socialist Republic, previously known as the Russian Soviet Republic and the Russian Socialist Federative Soviet Republic, as well as being unofficially known as the Russian Federation, Soviet Russia, or simply Russia, was an independent state from 1917 to 1922, and afterwards the largest, most populous and most economically developed of the 15 Soviet socialist republics of the Soviet Union (USSR) from 1922 to 1990, then a sovereign part of the Soviet Union with priority of Russian laws over Union-level legislation in 1990 and 1991, during the last two years of the existence of the USSR. The Russian Republic comprised sixteen smaller constituent units of autonomous republics, five autonomous oblasts, ten autonomous okrugs, six krais and forty oblasts. Russians formed the largest ethnic group. The capital of the Russian SFSR was Moscow and the other major urban centers included Leningrad, Novosibirsk, Yekaterinburg, Nizhny Novgorod and Samara. Gennady Eduardovich Burbulis is a Russian politician. A close associate of Boris Yeltsin, he held several high positions in the first Russian government, including Secretary of State, and was one of the drafters and signers of the Belavezha Accords on behalf of Russia. He was one of the most influential Russian political figures in the late 1980s and early 1990s and one of the main architects of Russian political and economic reform.